When I talk about Spain as the “bold frontier” of gin, you’ve got to understand: I’m not kidding. From the nation that brought you “purple gin” (COOL Gin ), we now have a “green gin” — or Dry Gin 19. The color is usually indicative of flavors added post-distillation. Though, this hue in particular doesn’t seem reminiscent of a bathtub style. It is genuinely odd: a bright, somewhat mint or lime Jolly Rancher shade. I’d guess that whatever was added is only a small portion of the overall list of botanicals: all 19 of them. Only a small list are available: Angelica, Cardamom, florence lily, Cilantro, cinchona, star anise, nutmeg, cinnamon, cálamos, Lemon, Black Tea, Chammomile, licorice. A couple possibilities exist but none readily come to mind as to what may have given this its shade. Firstly, the color: pale mint, somewhat fake lime, dilute food coloring. A washed out grass color. Very hard to place, it probably most resembles the color of broccoli leaves to me. The nose of Dry Gin 19 is surprisingly juniper-led but with an ethanol and alcohol-fume background..
Palate: Rather subtle, not quite overwhelming. Juniper and a touch of citrus early, herbs, and floral notes come on the mid and finish,subtle in the back of the throat and edges of the palate. In the middle Hyacinth, and juniper. On the finish Tea, fresh cut grass and garden smell come to mind. The finish is dry and somewhat bitter with a souring and lingering aftertaste. Only a dash of heat, somewhat easy to drink, but overall lacking in refinement. Sour and somewhat flat with a vegetal after taste. 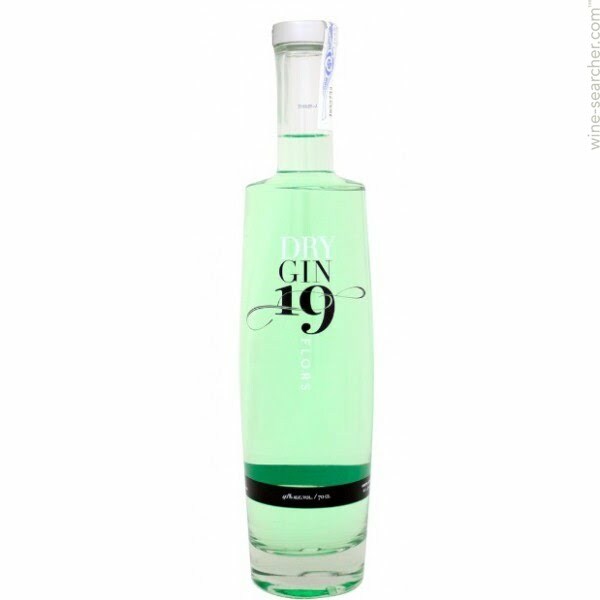 Firstly, the color is enough to bring attention to Dry Gin 19. That alone might get some looks at a part in the gin and tonic or martini. But the taste seemingly only brought out some of the less exciting notes in Dry Gin 19. Kind of sour, kind of flat. A touch of juniper, but a dash of bitterness other than that which the quinine usually affords. I tried increasing the ratio to make it closer to 1:1 in terms if gin to tonic, but the flavor which came out most strongly was that of tree leaves. Summery and green, but I’m not sure that it really works as a gin in this way. I thought that Dry Gin 19 worked a touch better in a martini, simply because the martini added some more uplifting herbal notes that overpowered the gin. It beat it into submission, and didn’t add much, I liked the notes that came out neat best of all the ways I had it. Dry Gin 19 is a little more bitter than you would hope. I think the novelty ended at the color for me. I would have liked a little bit more balance in a flavor, and a bit more restraint in the vegetal notes. I think the botanical selection is interesting, and there’s no reason outright why a green gin can’t work. But this one just doesn’t work for me.